Today I am reviewing Two Suitors for Anna, the third book in the A Keepsake Pocket Quilt series by Molly Jebber. Molly Jebber has written a superb sequel in this series! Normally, the first book of the series is the hardest to write. After all, the writer is introducing the main characters, the community, and creating a story around them. And Molly did a great job with Change of Heart, the first book in the series. But I have to say how much I enjoyed reading Two Suitors for Anna. . . poor Anna has a difficult, if not impossible, task of getting through to Noah, who brushes off her ideas, her opinions, and her decisions. Noah may be a wonderful person, but honestly, I wanted to smack him upside the head a few times! I don’t want to ruin the story for you, so I’ll stop now. . . with a plea to read this amazing story! 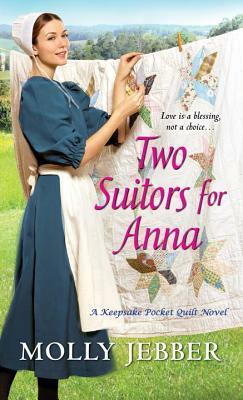 Two Suitors for Anna… a A Keepsake Pocket Quilt novel by Molly Jebber – Tweet this! Two Suitors for Anna was a beautiful story to end the series with. Gotta love those stubborn characters…lol! The ones you want to rail at or tell them to get some sense into their heads 🙂 This one sounds like my kind of book! Thanks for your lovely reviews Donna!